Glad you could join me on this follow up blog post. In the previous post "Fatal Attraction" I said I would share with you what vice lures and tempts me in everyday life. Have you guessed it? If you are thinking cupcakes, you are close! Its is Sugar! Yes the sweet stuff that makes everything taste so good. Earlier in the year I was advised to completely cut this down from my diet. Well needless to say, when someone tells you that you can't have this or that, it is then you crave it all the more!! This mixed media painting reflects that. The artwork is actually Wk23 catch up lesson for Life Book 2013 with the gorgeous Tamara Laporte from Willowing. 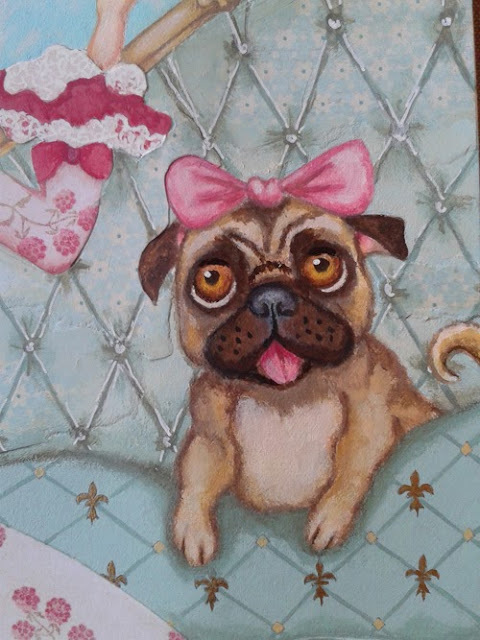 I highly recommend any of her classes.The theme was honouring our feelings in a mixed media painting with a whimsical character. Tam suggests we connect with our feelings and not to ignore them. 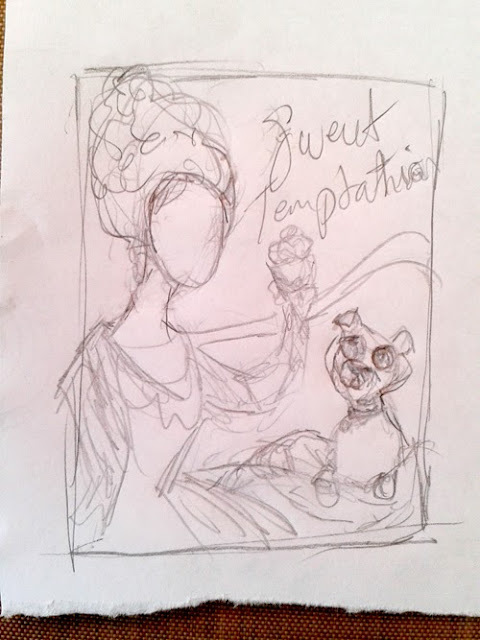 The connection for me was sugar, Marie Antoinette came to mind, holding a cupcake sitting on a chaise lounge with her dog by her side. When I want to get my ideas down quickly, I grab any piece of paper. The sketch can be either rough like this, or more detailed. 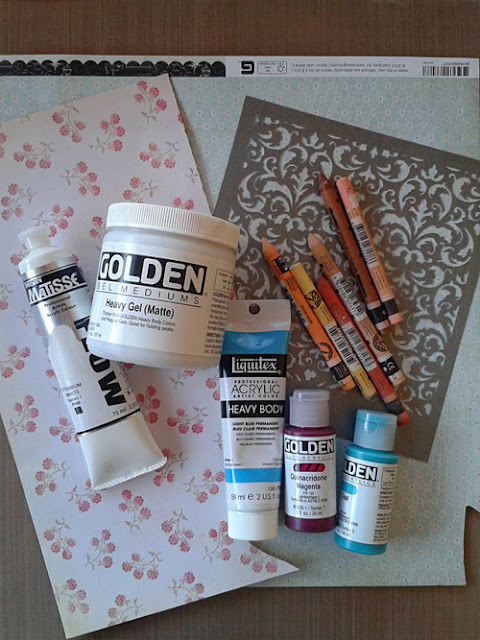 Here are some of the materials that I used for this art piece. I liked the face on the previous art post "Fatal Attraction",so I decided to include her in this mixed media piece. 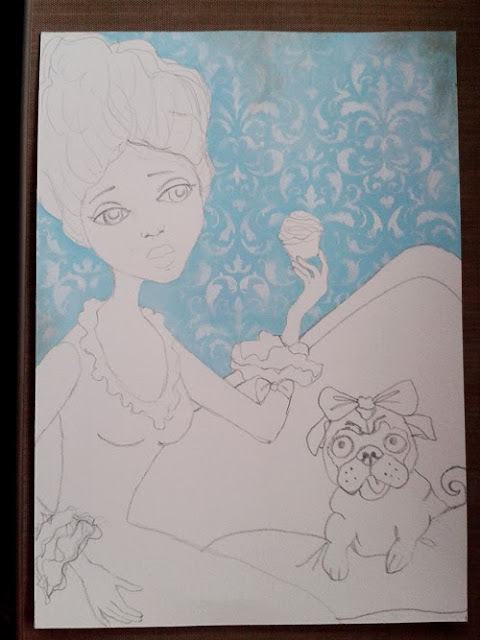 To give the background a little olde worlde feel, I used a damask stencil. I forgot to take photos of the next few steps, as I was working quickly gluing down the scrapbook papers and adding in the main base colours. I also started to add a bit of depth and detail to the chaise lounge and characters. 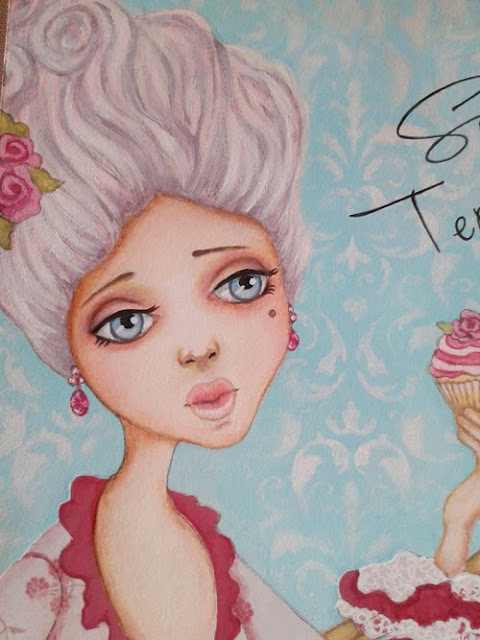 Close up of Marie Antoinette. I deliberately made her gaze go slightly past the cupcake because for me I know there is temptation all around me, but I now choose to focus on healthier foods. Going back and forth adding more shading and highlighting. Final touches with a white posca paint pen for the lace. I am not a great fan of my own hand writing, so I printed the title out and used transfer paper to place it on the artwork. I went over this with a black posca paint pen. Voilà! Finished. Hope you enjoyed this post. As always comments are welcome and encouraged, thanks. I absolutely LOVE the cute bulldog, Serena! So cute! Serena, this is so adorable! Her face is so gorgeous, her eyes are a dream, perfect just like her nose and mouth. 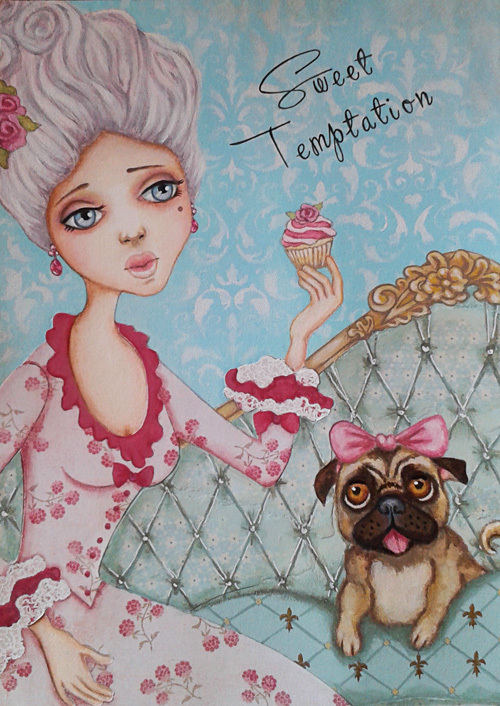 Not to mention her pug's face, pose and expression looking at that cupcake, it makes me want to hug them both! 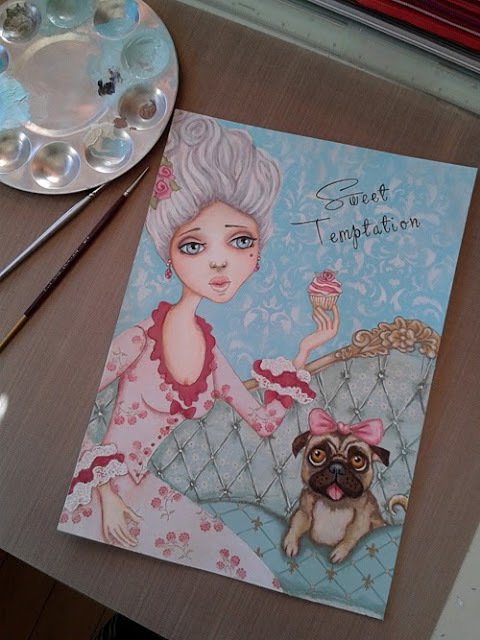 I'm so glad I found your blog, your art is stunning, I love every detail here, her clothes, hand, that gorgeous regal french seat, and this piece really does convey the feeling of the piece and your sugar cravings! Ahhhh I loooove love love love this!! !